which can be ordered from www.barnesandnoble.com or www.Amazon.com . I highly recommend it for all coaches - no matter what sport. Dealing with problems is a large part of the coach's role. Whenever people are working together in an intense situation, such as in sport or business, problems among participants or with the leader are bound to arise. How the coach handles the problems will go a long way in determining the respect the athletes have for him or her. The athletes may also be involved in problem solving with team leaders and captains playing an active role. Problems on teams seem to arise in some or all of the following areas. Team guidelines should be set for dealing with lateness for practices, games, buses, team meetings, and so on. Penalties such as extra work after practice, fines (so much a minute of lateness), sitting out the next game, and, finally, removal from the team with repeated offenses are some of the problem solving methods. 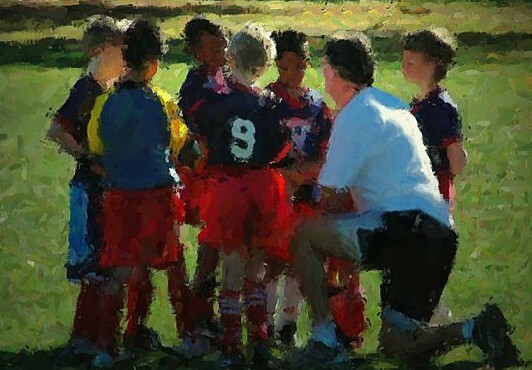 The coach is in a vulnerable position if the athletes are allowed to be late for team activities. If guidelines are set, they should be enforced. The coach should make sure that he or she has all the facts for the reason of the lateness before acting. A car breaking down, sickness, and the like are legitimate reasons. A good communication system should be set up, such as phoning the coach or manager or another teammate if a lateness problem arises. It is a good practice to tell the other athletes on the team why an athlete is late, and the penalty~ if any, for the lateness. Some teams have the leaders or captains look after the discipline for these problems. Conduct detrimental to the team. This can range from missing a curfew, drug- or alcohol-related problems, negative interaction with fans or media, or any action which is an embarrassment to the sport organization. It is important for the coach and the athletes to decide before the training begins what type of conduct is expected from the athletes. Once again, all the facts must be known before acting, but the coach and the team should have guidelines in place for what is expected from the athletes and the consequences of undesirable behavior. Consequences usually range from a reprimand to expulsion from the team, depending on the severity of the problem. Each year, it seems, some athletes miss major events because of curfew violations or are removed from the team for conduct detrimental to the organization. Some athletes may need professional help for extreme problems, such as drug use, and this should be considered as part of the solution in certain situations. Selecting athletes with good character goes a long way in solving problems before they happen. Certain athletes do not work hard in practices or games. This can be even more of a problem when the top athletes do not have a good work ethic. The coach must act on this if he or she wants to retain or gain the respect of the athletes. Establishing a certain work level that is expected from the athletes early in the training is a possible solution to the problem. If the work level is not reached, then the coach must act. Solutions range from talking to the athlete one-on-one, stopping training and pointing out the problem, extra work for the athlete in question, or, ultimately, suspension from the team. The coach must act if there is a poor work ethic by an individual or a team. If not, the situation will get worse, and the coach will be seen as weak. Athletes should know what level of work ethic is expected. Once again, if your top athletes work the hardest at training, the other athletes will usually follow their example. However, if the star athletes do not work hard, problems usually arise with the overall work ethic of the team. Interpersonal problems among athletes or with the coach. Very seldom does a group of people working together get along with few or no problems. Certainly, in the case of sport situations, where competition is intense and emotions are high, there will be some interpersonal problems. The coach should be alert to these problems, and the coach also can be assisted by the team leaders and/or captains. Problems should be dealt with as quickly as possible after they appear. Usually athletes have the common goal of performing well, and sometimes interpersonal problems can be tolerated because of this. Communication is, once again, the key with athlete-coach problems and should be looked after as quickly as possible. Each year that a coach is involved with a group of athletes, new problems seem to arise. The coach should have a definite philosophy as to what he or she expects, and this philosophy will go a long way toward solving problems. The coach should discuss this philosophy with the athletes at the beginning of the training season. It may be in extreme situations that certain athletes, no matter how talented, are not meant to work for certain coaches or certain organizations. If this is the case, then it may be better for both parties to part ways. However, most problems can be solved through effective communication; selection of athletes of good character; guide-lines for expected behavior; and quick, firm, but fair responses to problems. Remember professional and college hockey coach Bob Johnson's words: "If you don't want problems, don't get into coaching." The effectiveness of the coach in many ways is determined by how he or she deals with and solves the many problems which arise in the day-to-day running of a sport team.